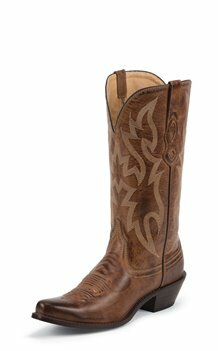 The Lantana Brown 12-inch tall Women's fashion boot features a golden brown leather body that’s slightly distressed giving it a lived in look. The cream stitching along the upper is simple yet bold and the diamond cut pull straps are a subtle detail that set this boot apart. The snip toe and elevated heel are fashionable yet allow for an easy fit and the cushioned insole keeps things comfortable for the cowgirl on the go.